Robert Sedgewick was born in Aberdeen, Scotland, on May 10, 1848. He was the son of Robert Sedgewick and Jessie Middleton. His family moved to Nova Scotia when he was a child. After graduating from Dalhousie University with a B.A. in 1867, he articled in Cornwall, Ontario, in the office of John Sandfield Macdonald. He was called to the bar of Ontario in 1872 and of Nova Scotia the following year. He practised law in Halifax for 15 years, first with John James Stewart, then with his brother, James Adam Sedgewick, and William Benjamin Ross. In 1883 he helped found Dalhousie Law School, one of the first university law schools in the British Empire to offer a degree in common law. He was among the first professors at the school. In 1888 he moved to Ottawa to accept the position of Deputy Minister of Justice. 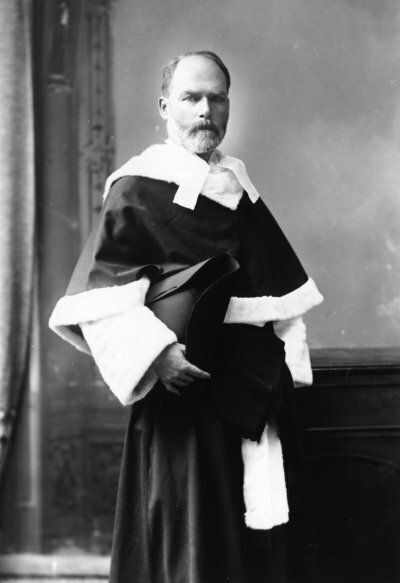 In that capacity, he played a major role in the drafting of the first Canadian Criminal Code of 1892. He was appointed to the Supreme Court of Canada on February 18, 1893 and served on the Court for 13 years. Justice Sedgewick died on August 4, 1906, at the age of 58.